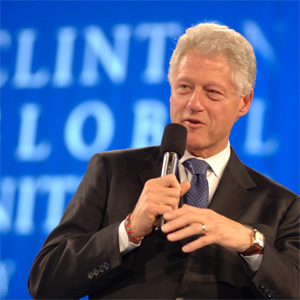 Former President Bill Clinton will host the third Clinton Global Initiative University (CGI U) April 16-18, 2010, at the University of Miami. The event, which is expected to convene approximately 1,500 college students, university officials, and representatives from youth organizations from all parts of the world, will focus on global challenges in education, environment and climate change, peace and human rights, poverty alleviation, and public health. Last year, President Shalala, Assistant to the Vice President for Student Affairs Gail Cole-Avent, and 15 undergraduate and UM School of Law students participated in the second annual CGI U, held at the University of Texas at Austin. CGI U builds on the successful model of the Clinton Global Initiative, now in its fifth year, to engage college students and administrators to make commitments to address global issues with practical and innovative solutions. All CGI U meeting attendees make a “Commitment to Action” – a comprehensive, formal plan of action to address a specific problem on their campus, in their community, or in another state or country. All students wishing to attend must submit an application outlining their commitment by going online to www.cgiu.org. Participants in the three-day CGI U will discuss how student activists can make a difference around the world, and each student and university in attendance is asked to make a personal Commitment to Action. Over the course of the meeting, attendees will participate in working and skill sessions to brainstorm ways to make a difference. Students get the opportunity to interact with global leaders and are encouraged to form partnerships with other students. On the final day of CGI U, attendees will collaborate with students from the University of Miami to take part in a community service activity. Click on this link to a news release that features a video of UM President Donna E. Shalala commenting on the University’s hosting of the 2010 CGI U.